He was a Fox News military analyst for many years. Now he says Fox is doing a "great deal of damage" to the United States. 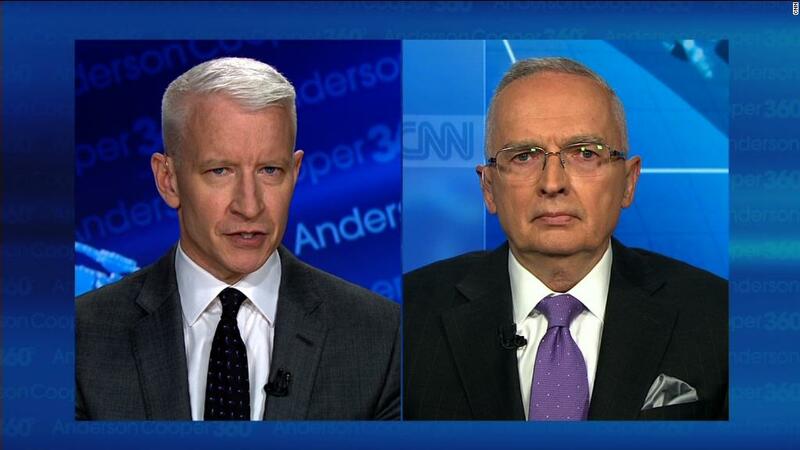 Ralph Peters left the network in March after sending a blistering farewell note to some of his colleagues. The note shocked the TV news industry because he accused Fox of "assaulting our constitutional order and the rule of law." He sounded like one of Fox's most vociferous liberal critics. But Peters is a staunch conservative who feels the network has lost its way. On Wednesday he gave his first TV interview since leaving Fox. He told CNN's Anderson Cooper that some of Fox's hosts are doing "a great grave disservice to our country." Peters was sometimes very critical of President Trump during his appearances on Fox. And he repeated that criticism on Wednesday, telling Cooper he believes that Trump is "frightened" of Vladimir Putin. He said, "I am convinced that Vladimir Putin has a grip on President Trump," adding, "I hope I'm wrong." Peters, who was a US Army lieutenant colonel before becoming a Fox military analyst, based his assessment on what he called his understanding of how the Russian government operates. He also strongly defended the importance of Robert Mueller's probe of Russian interference -- a position that puts him at odds with former colleagues like Sean Hannity. "Without exaggeration, the Mueller investigation is the most important of my lifetime, and I am 66 years old. I lived through Watergate," Peters said Wednesday night. In the interview, Peters doubled down on what he said in his Fox resignation letter back in March. "For years, I was glad to be associated with Fox. It was a legitimate conservative and libertarian outlet, and a necessary one," he said Wednesday. "But with the rise of Donald Trump, Fox did become a destructive propaganda machine, and I don't do propaganda for anyone." Peters said the Fox hosts who constantly attack Mueller are "doing it for ratings and profit" and "doing a great grave disservice to our country." Cooper asked him: Do those hosts "believe the stuff they are saying" about the FBI and Justice Department? "I suspect Sean Hannity really believes it," Peters said. "The others are smarter. They know what they're doing. It's bewildering to me. I mean, I wanted to just cry out and say, 'How can you do this?' How can you lie to our country? How can you knowingly attack our Constitution, the bedrock of our system of government, the bedrock of our country?" A Fox spokeswoman said the network's original comment about his exit still stands. "Ralph Peters is entitled to his opinion despite the fact that he's choosing to use it as a weapon in order to gain attention," the network said back in March. "We are extremely proud of our top-rated primetime hosts and all of our opinion programming."